There are many things I love about being a food blogger. I get to cook and think about food literally all the time. I get to experiment with new recipes, new ingredients, and new cooking techniques, which is way too much fun. And, every once in a while, an awesome local artisan food producer will let me poke around their production facility and see how things work. Recently, I had just such an experience with Quince & Apple, the makers of delicious small-batch preserves and cocktail syrups. And let’s just say, it was a fantastic experience. Quince & Apple, founded by husband and wife Matt and Clare Stoner Fehsenfeld, started with just the two of them producing and selling handcrafted jams and preserves. As time went on and people began to discover how incredibly delicious Quince and Apples products were, the company continued to grow. Now, Quince & Apple has several employees, and is still continuing to expand their kitchen and warehouse space to accommodate the growing popularity of their delicious products, which include seven kinds of preserves and five kinds of cocktail syrups. 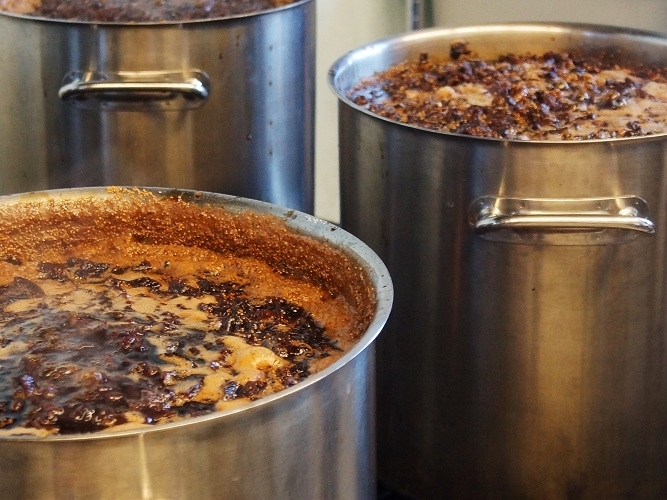 During my visit to Quince & Apple, the preservers were hard at work making a batch of Figs and Black Tea preserves, one of their most popular products. Let me just say, the kitchen area smelled absolutely amazing. And what was going on in the kitchen was amazing too. All of the ingredients Quince & Apple uses are locally sourced when possible, and the preserves are made in small batches, so that each one can be tasted and adjusted to ensure a great tasting final product. Minimal sugar is added, so that the flavors of the fruit can really be showcased. 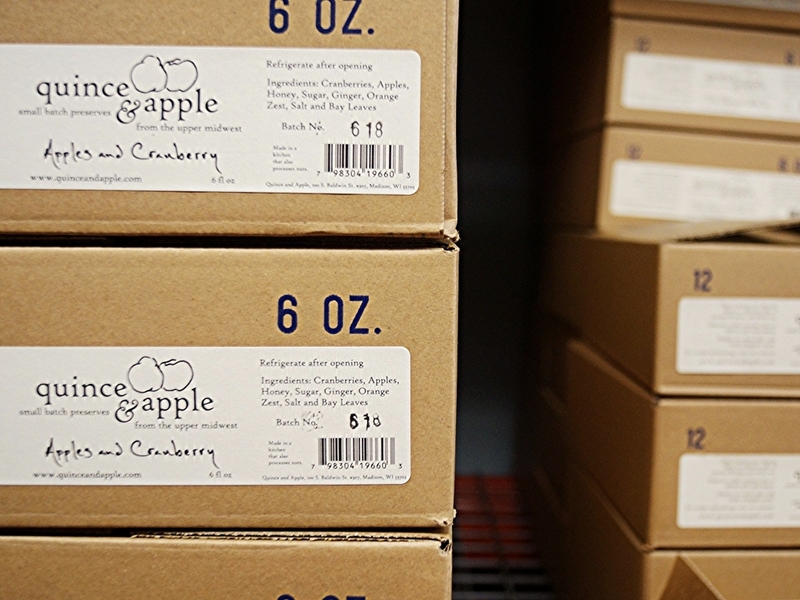 Not to mention, the entire process, from ingredient prep, to cooking, to packing, to labeling is all done by hand. It’s no wonder everything coming out of their kitchen is so tasty. Quince & Apple makes a variety of preserves, ranging from Tart Cherry and White Tea to Shallot Confit with Red Wine. I love eating these on pretty much anything, especially as an addition to a nice cheese plate (you know how much I love cheese). Their cocktail syrups, with flavors like Lime and Cucumber and Rhubarb Hops are also fantastic. In fact, you may remember us touting their Tart Cherry Grenadine for use in this lovely libation last fall. Regardless of what preserve or syrup you try, I’m sure you’ll have no trouble coming up with something delicious to do with it. 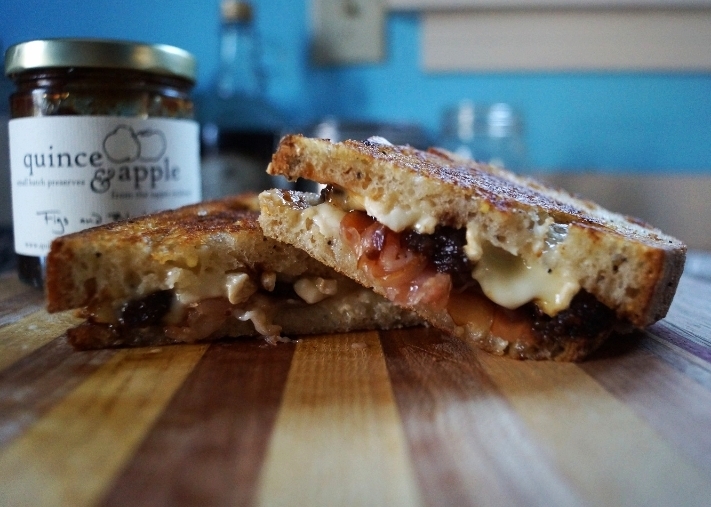 But just in case you’re a little stuck, I’ve included a recipe for one fantastic grilled cheese sandwich, replete with salty prosciutto, creamy Camembert, and of course a good dollop of Figs and Black Tea. It’s heavenly. 1. Place a griddle or skillet on the stove and heat to medium heat while you prepare your sandwich. 2. Spread 1 tsp butter on one side of each slice of bread. Place one bread slice butter side down, and top with half the Camembert, the prosciutto, the preserves, the remaining Camembert, and the other slice of bread, butter side up. 3. Place sandwich on heated griddle and cook, flipping once, until bread is golden brown on both sides and cheese is melted, about 2 minutes per side. 4. Slice sandwich in half, eat immediately.